This was my first post-apocalyptic Word of Commodore and I really enjoyed the day. The display of the machines "museum style" is a great idea and having my first gander at the C65 was really cool. The demos were informative and interesting. The passion of each presenter was easily noticeable through the topics they presented. What amazed me most however was seeing that people are still actively writing apps and experimenting with new hardware for these old but not forgotten machines. The creativity is fantastic. It was really nice to mingle and meet with fellow Commodorks. Kudos to the organizers who no doubt sacrificed a lot of their personal time to put the event together. That was some damn fine cake. 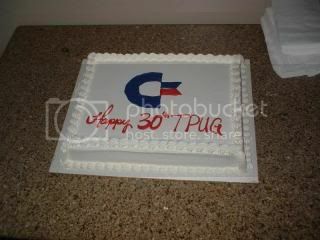 Next year will be TPUG's 31st anniversary and while it isn't much of a milestone, I think we'll have another cake. Could mark the 25th anniversary of the release of the Amiga. Motion seconded! Thanks, Golan, Ian, and everyone else who contributed to WoC's success! Thanks to everyone who made this a great event, I finally convinced my wife to come and we brought our 3-year-old who's played with our C128's at home. It was even better than I've been telling her about prior WOC's, and she actually conceded that I may not be such a "sad b*st*rd" after all. It was truly a great event!